Put on your parka and binoculars and GO! In the year 1900, the holiday season was approaching. With that would come the Christmas "Side Count," when, by tradition, you'd go out and shoot as many birds as you could. But a birder named Frank Chapman proposed that people go out and count birds, instead. Today, the Christmas Bird Count is the oldest bird count in the world. And anybody can participate. 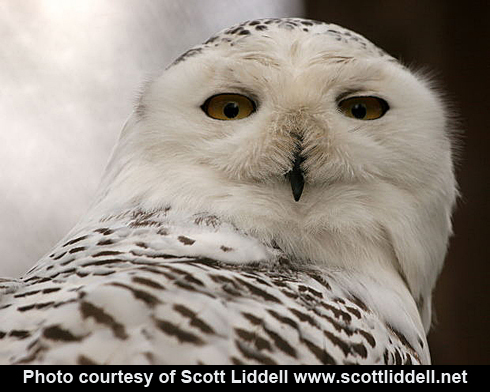 If you're lucky, maybe you'll spot a Snowy Owl. The year is 1900, and the holiday season is approaching. With that comes the Christmas “Side Count,” when, by tradition, you’d go out and shoot as many birds as you could. [Gunshots in the background] But conservation was on the rise, especially with the formation of the Audubon Society. “I went on my first Christmas Bird Count when I was new to the area, so I had no idea which bird was which. But I went with these two guys – They were both incredible birders. I felt like such a novice. It was cold and miserable that morning, as I recall, until we spotted a Snowy Owl, just sitting on an abandoned runway in an old airfield. And the next year, I still didn’t know a whole lot about the birds of the area, so I was the official “spotter.” And that’s OK – every team needs a good spotter! Sometimes the best birders just don’t see the birds. To find the Audubon count near you, begin at our website, BirdNote.org. Give it a try! Bird sounds provided by The Macaulay Library of Natural Sounds at the Cornell Lab of Ornithology, Ithaca, New York. Snowy Owl call  by Gerrit Vyn, call of the Snowy Owl  recorded by G.A. Keller, and song of Brown Creeper recorded by T.G. Sander. Find a Christmas Bird Count near you in the US! Canadians, find a CBC circle near you!